Do you have trouble falling asleep at night? Do you wake up in the middle of the night and stay awake for hours? You’re not alone. Millions of people struggle with falling and staying asleep. Including me. I’m writing this article on how to get a good night’s sleep at 3 am! I was unable to fall back to sleep after 20 minutes of lying in bed and I think I know why. More about that later. Stress, depression, changes in work schedule, chronic pain, the Internet, medical problems, and caffeine can all cause sleeplessness. The good news? By learning to avoid activities that get in the way of sleep and practicing a few simple sleep-inducing techniques, you can start enjoying restful, quality sleep every night. Most adults need seven to eight hours of sleep a night. That amount stays about the same throughout adulthood. However, as we age, we may sleep less at night and take naps during the day. If you regularly feel tired during the day, that’s a good indication that you aren’t getting enough sleep at night. Sleep is a biological necessity. I simply can’t emphasize too strongly the importance of getting enough sleep. When you don’t, it affects your mood and can make you irritable and cranky. In fact, the emotional centers of our brains are over 60 percent more reactive when we’re deprived of sleep. Lack of sleep also causes reduced energy and lower productivity during the day. It can impair your ability to concentrate, solve problems, make decisions, and remember things. It can also weaken your immune system so you’re more vulnerable to flu, cold, and other infections. Even worse, extended periods of sleeplessness can put you at increased risk of diseases such as high blood pressure, heart disease, diabetes, and obesity. But you can do something about it. Sure sleeplessness can be frustrating. But if you’re like most people, making a few simple changes in your daily routine is all you need to improve the quality of your sleep and begin sleeping well every night. Sometimes just getting an extra 30 minutes of sleep a night can make all the difference. And these steps can help you get it. Express your thoughts and feelings. A lot of people have trouble falling asleep because they can’t shut their minds off. They lay in bed, fretting and worrying, tossing and turning. One of the primary reasons this occurs is due to unexpressed thoughts and emotions. If this sounds like you, spend a few minutes writing down your thoughts, worries and other feelings. You can also try talking to a friend, family member, or a therapist. Just getting your thoughts and feelings out of your mind and off of your chest can bring surprising relief. Create a sleep schedule and stick to it. Go to bed and wake up at the same time every day, including weekends. This will help you train your body to sleep at night. Develop a relaxing bedtime routine. Do the same thing every night before you go to bed. For example, take a warm bath (the warm water will help you relax) and then read for 10 minutes every night before hitting the sack. Soon you’ll connect these activities with sleeping, and doing them will help make you sleepy. Eliminate doing activities in your bed that can stimulate your brain and make it harder to fall asleep, like watching TV, talking on the phone, surfing the web on your laptop, eating, and working. If you suffer with anxiety, never watch the nightly news, as this will only increase your worry. Create a comfortable setting for sleep. Make sure your bedroom is dark and quiet. If there’s a noise problem, turn on fan, air purifier, or sound machine to mask the noise, or use earplugs. If you must sleep during the day, hang a dark blind over the window or wear an eye mask. Keep on eye on the temperature, too. If your bedroom is too cold or too warm, it will affect your ability to fall and stay asleep. Studies show that seventy-two degrees Fahrenheit is the ideal temperature for sleep. Your mattress could also be the problem. Try varying its firmness by placing a board underneath it or adding a memory foam or egg-crate topper. If that doesn’t work, it may be time to buy a new mattress. Get some exercise. Regular exercise in the morning or early afternoon can make it easier to fall asleep and help you sleep better. Avoid exercising late in the day, as it will have the opposite effect. It tends to stimulate the body and raise its temperature, which can make it difficult to fall asleep. 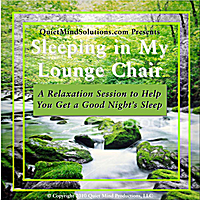 Sleeping in My Lounge Chair, a guided relaxation session designed to help you quiet your mind and relax your body so you can enjoy a better, deeper, more satisfying night’s sleep. Limit your caffeine consumption. Coffee, energy drinks, and caffeinated sodas stimulate your nervous system and can be a prime culprit when it comes to sleep troubles. It’s easy to get trapped in a vicious caffeine cycle. You don’t sleep well at night so you use caffeine to keep you awake during the day. But the caffeine you consume during day prevents you from sleeping at night. If you drink several cups of coffee a day, try reducing your consumption by eliminating one cup a week, until you are caffeine free. And remember, caffeine is not only found in coffee. Most soft drinks, especially colas, contain caffeine, which combined with sugar, is a sleep depriving double whammy. Caffeine is the reason I haven’t been able to fall back to sleep tonight. I drank too much cola at a late night dinner and now I’m paying for it. After 20 minutes of sleeplessness I got up to write. Have a light snack before going to bed. The emphasis here is on “light.” A heavy snack can actually cause sleeplessness. A glass of warm milk, some cheese and crackers, or a piece of fruit should do the trick. Stay away from foods that can contain caffeine or lots of sugar, like chocolate, caffeinated soda, and other sweets. Skip the nightcap. While a glass of wine, a beer, or a cocktail may help you fall asleep faster, it comes with a price. Alcohol affects sleeping patterns, especially your deeper sleep cycles, and dehydrates your body causing you to wake up after just a few hours of sleep. Avoid naps. Taking naps during the day, especially long naps, will make it difficult to sleep well at night. Your body will not need 8 hours at night, if you’re getting two hours during the day. Like the caffeine trap, you can fall into a nap trap. Because you don’t sleep well at night, you take a nap during the day. But because you nap during the day, you don’t sleep well at night. If you feel sleepy during the day, instead of napping, try getting some light exercise, instead. It will increase your energy levels and get your adrenaline pumping. Force yourself to go to bed but don’t try to make yourself fall asleep. Many people engage in activities long into the night when they know they must get up early in the morning. This makes it impossible to get the seven to eight hours you need. The Internet can be particularly addicting and people can get caught on the web for hours. You must force yourself to go to bed. Once you are in bed, if you’re still awake after trying to fall asleep for 30 minutes, get up and go to another room. Sit quietly for about 20 minutes before going back to bed. Do this as many times as you need to until you fall asleep. Trying to force yourself to sleep is counterproductive and simply won’t work. Accept those nights when you don’t sleep. You’ll still be able to function on a few hours. The less you fight, resist, or fear sleeplessness, the more it will go away. Instead of fighting sleeplessness, tonight, I simply got up to finish writing this article. Now that I’m a bit tired, I’ll go back to bed. Wish me luck. Incorporating just a few of these small changes into your daily routine can make a big difference. Give them a try and start getting a better night’s sleep tonight. If you still can’t fall asleep after trying these techniques, it may be time to talk to your doctor. Sometimes insomnia is the result of a deeper medical or psychological problem, like depression, anxiety or sleep apnea. Symptoms of sleep apnea can include loud snoring, episodes of not breathing followed by a loud gasp for air, and restlessness. During the day you’ll feel tired, and may have headaches, heartburn or a sour taste in your mouth. Once the reason for you insomnia is diagnosed, treatment can be provided. Medication is often considered and is a valuable alternative if the suggestions in this article do not help. Visit your doctor to discuss your treatment options. Do you have any special techniques you use to help you fall asleep? I’d love to hear them. Email them to me at kengoodman@quietmindsolutions.com and I may just include your suggestions in a future article. "It was so frustrating lying awake in bed at night, but now I fall asleep in no time. The soothing sounds and relaxation techniques really help me get a good night's sleep. I highly recommend listening to it if you're having trouble sleeping."